Hyderabad: Ridership on Day 1 on -LB Nagar stretch crossed 19,000 as per the data given by the L&T Metro Rail (Hyderabad) Limited (LTMRHL) authorities. 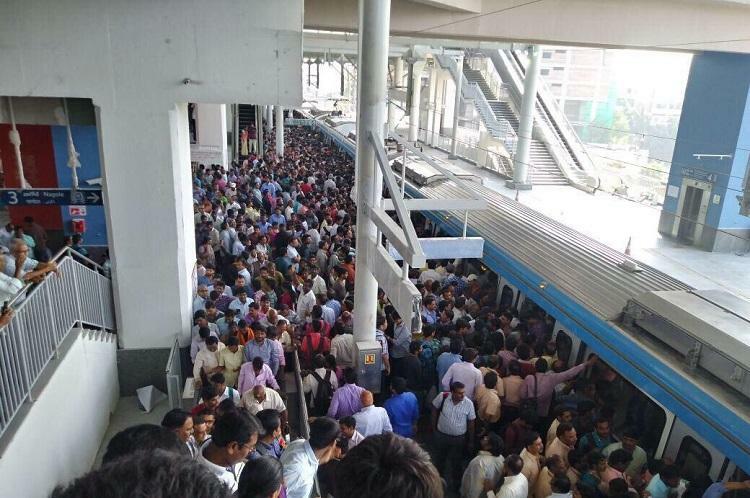 On the inaugural day commuters gave thumbs up to the metro line. The ridership figures are definitely encouraging and Hyderabad Metro officials are confident that the numbers will go much higher than this. It was this week that commercial services of metro began on the Ameerpet -LB Nagar stretch. In the very first day, metro ran 71 trips in both directions. The numbers are very encouraging and show that people in the city are using metro services over other modes of public transport. The operations began at 6 am in the morning and last train departed at 10.30 am. With the stretch becoming operation a total of 270 trips will be made in both direction post inaugural of the Hyderabad Metro line. The 16-km stretch will officially inaugurated on Monday. Governor E.S.L. Narasimhan flagged off the metro train from the Ameerpet metro interchange station towards LB Nagar in the city. This Ameerpet -LB Nagar stretch will also be second largest metro network after Delhi. As per Hyderabad Metro officials the line JBS to MGBS stretch and the Hi-Tec City stretch needs to be commissioned before considering the financial status of the project. Hyderabad Metro Rail Limited (HMRL)managing director NVS Reddy informed that work construction work is in advanced stages on the Metro rail till Mindspace Station. Reddy also shared that by mid 2019 work on JBS to MGBS stretch of the Metro rail, part of the Corridor-2 will be completed. With this all three line will be made operational by end of 2019. Institution of Civil Engineers has also shortlisted Hyderabad Metro rail project as one of the top 10 projects across the globe for the “Best Engineering Project of the World” award. In coming months, the number of riders on Ameerpet -LB Nagar stretch will determine the success of this route.